Students - I needed to do a bit of research for today's poem. I have not lived in a big city for a long time, and when I did live in New York City, I was not a child. I never played in spraying fire hydrants. I wanted to write about doing this today, and so I needed to find out, "Does this really happen?" But in order to be safe, it is important to get a special cap for your city fire hydrant. Otherwise, it will spray 1,000 gallons per minute, compared to 20 - 25 gallons per minutes with a splash cap. Too much spray, and water is diverted from where it's needed: fires. And too much spray can also push people around and get them hurt. Here is what a spray cap looks like. Today's poem also has an interesting rhyme pattern. Can you figure it out? Which words rhyme? Another something to notice in today's poem is the way that I made the fire hydrant seem almost like a person who enjoys the company of children. We call this personification, when a writer gives human qualities to something not human. 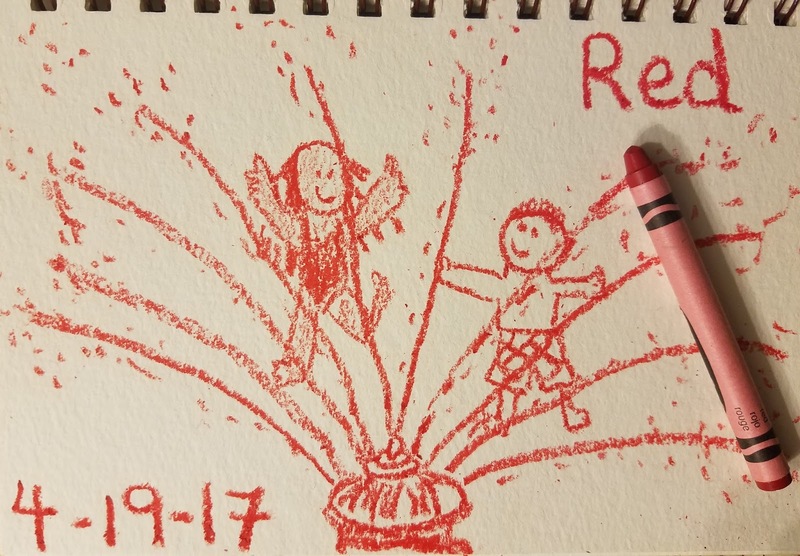 I enjoy using personification because it allows me to pretend that I am thinking and feeling as something besides my plain old self -- today, a fire hydrant loving children in summertime. If you are Writing the Rainbow with me, perhaps your color for today will make you think of an object that you imagine has some human feelings. Or perhaps you, too, will find yourself doing a bit of unexpected research. Whichever path you choose (or whichever path chooses you), embrace it. And please don't miss the links to all kinds of Poetry Month goodness up there in my upper left sidebar. Happy nineteenth day of National Poetry Month! 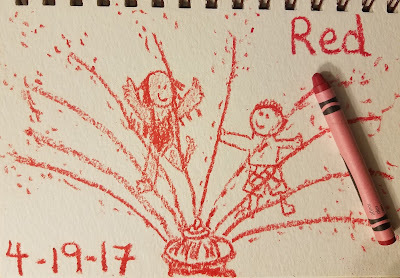 Such fun to see that fire hydrant drawing and know where red had taken you. I imagine that playing in the water from a fire hydrant must be summer fun at its best.